Our website will provide all relevant information for Primary Schools GAA activities in Waterford. Cumann na mBunscol Waterford useful pages. Welcome to cumannnambunscolwaterford.com. Our website will provide all relevant information for Primary Schools GAA activities in Waterford. All our fixtures, results and news will be accessible on the website. We have over thirty schools affiliated to the board and each school will have their own page where news regarding GAA activities in each individual school can be posted. We acknowledge the excellent work which teachers are doing in the schools promoting our National Games. We wish to thank Allianz the national sponsor of Cumann na mBunscol for their continued support. In addition we acknowledge the support of the Munster Council, Waterford County Board, Waterford Coaching & Games Committee and the local GAA Clubs who have always given us the fullest of cooperation. 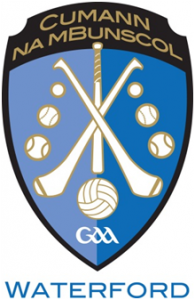 Fixtures for U-13 Hurling competitions are now available on the website under the camogie & hurling tab. Games in Roinn..
Fixtures for U-13 Boys Football competitions are now available on the website under the football tab. Games in Roinn A,..